Like the name says, this stuff is seriously the best ever hot fudge sauce. What it doesn’t say is that it’s so easy you’ll hardly believe it! EASY. As in super easy! The reason I feel a little sheepish is because it’s so easy it’s actually embarrassing to even call it a recipe. Am I exaggerating? Nope; this is how it works – throw all the ingredients in a blender except the half and half which is heated in the microwave till it’s good and hot, then quickly added to the blender contents. Cover and push the ON button. 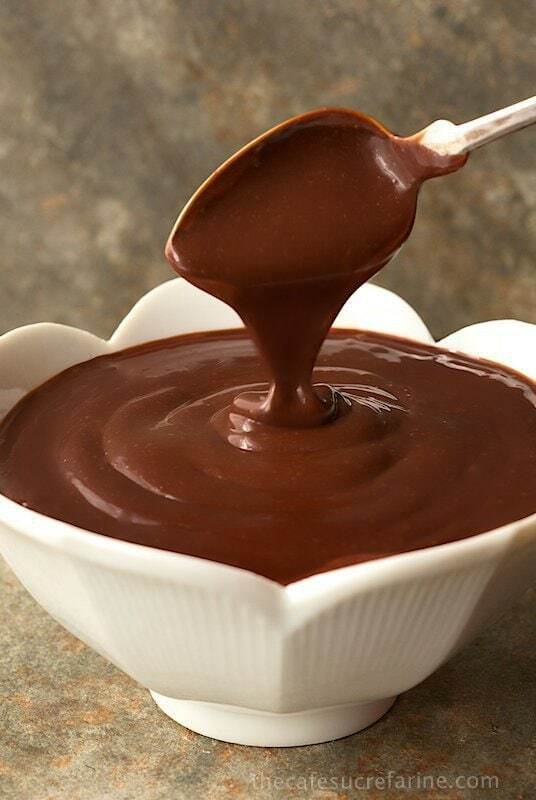 Less than 2 minutes later you’ll be staring at the most luscious, deep, dark, rich, silky-smooth chocolate sauce you’ve ever had the pleasure of meeting. See what I mean? Embarrassingly simple. But you know what? I won’t tell a soul if you don’t. We’ll just keep this magically delicious, super simple secret to ourselves and enjoy the accolades, okay? Oh, and speaking of secrets; there is one important little detail I need to share regarding this recipe. Use a good quality chocolate. It can be semisweet or bittersweet, I’ve had good results with both. 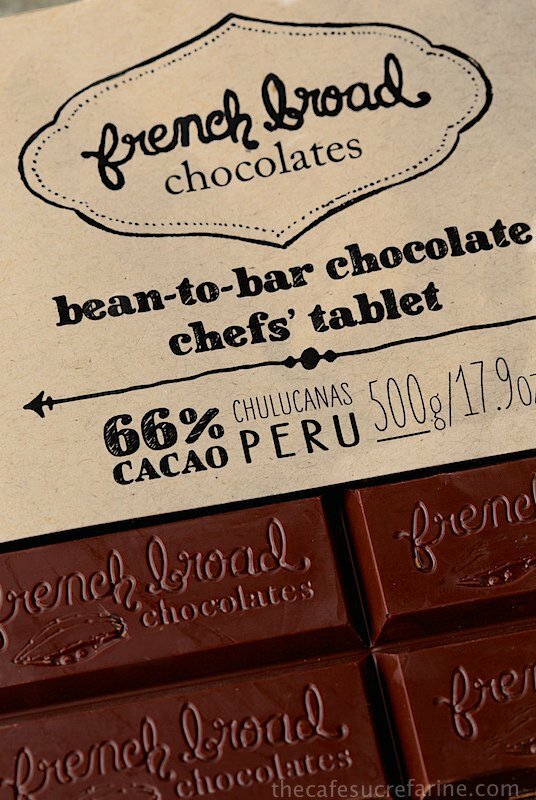 Good quality chocolate chips will work as well bars of fine chocolate, like the French Broad chef’s tablet that you see in the pics. Scott and I became familiar with French Broad Chocolate last month when we attended an amazing blogging conference in Asheville called Food Blog Forum. The food scene in this beautiful mountain town is phenomenal and the Asheville’s Convention & Visitors Bureau – Explore Asheville, along with their tourism website, aptly named, Foodtopia, literally rolled out the red carpet for the attendees of the conference. We were able to personally meet many of the local proprietors, chefs, farmers, vinters and craft beer makers. We were wined and dined beyond anything I’d imagined and were taken on a private culinary tour of the famous Biltmore House. The tour was followed by an incredible dinner prepared by local chefs and served in a large white tent on a hillside overlooking the lovely Biltmore. The beautiful Biltmore House, from our dinner venue, a big white tent up on the hillside. 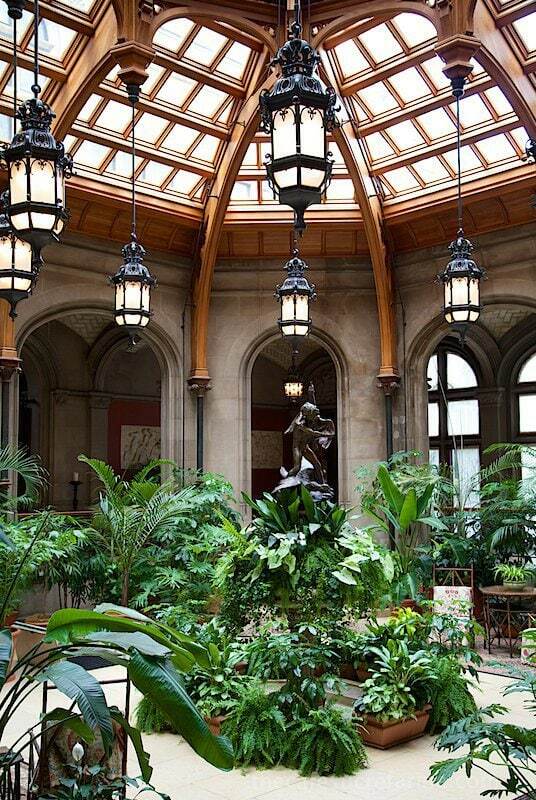 The Atrium, a beautiful sight as you walk through the front doors of the Biltmore Estate. It was where Cornelia Vanderbilt was married in 1924. We were given a fascinating behind the scenes culinary tour and full photography privileges, which are usually forbidden inside the estate. 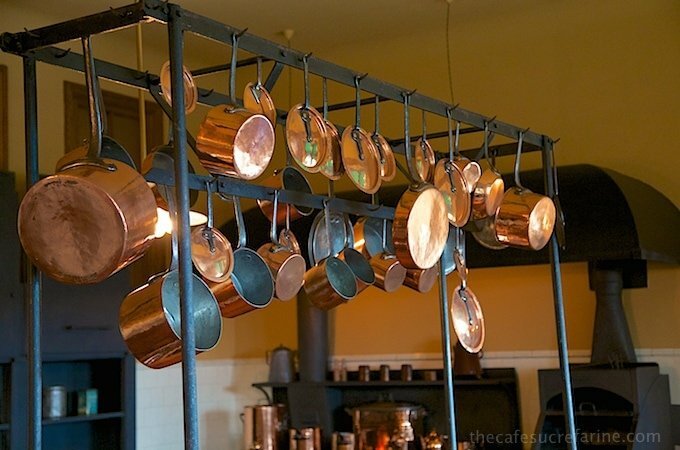 Good thing I don’t have this many pots, can you imagine the trouble I’d get into in the kitchen? Everyone we met in Asheville was so friendly and hospitable, but I must say, we really enjoyed meeting the folks from The French Broad Chocolate Shop. Jael, one of the owners, couldn’t have been sweeter and the samples of their wonderful chocolate creations were unbelievable; it’s the stuff that chocolate lover’s dreams are made of! When I was looking through the swag (goodie) bags from the conference and noticed large bars of their bittersweet chocolate, well let’s just say – I let out a little squeal and began planning what I would do with it. I knew for sure that some of it would go into this wonderful chocolate sauce. I’ve made this dessert sauce a zillion times, but I have to say the French Broad chocolate took it way over the top. If you’ve got a get-together coming up and you don’t have time for a fancy dessert, don’t worry, no one will care. 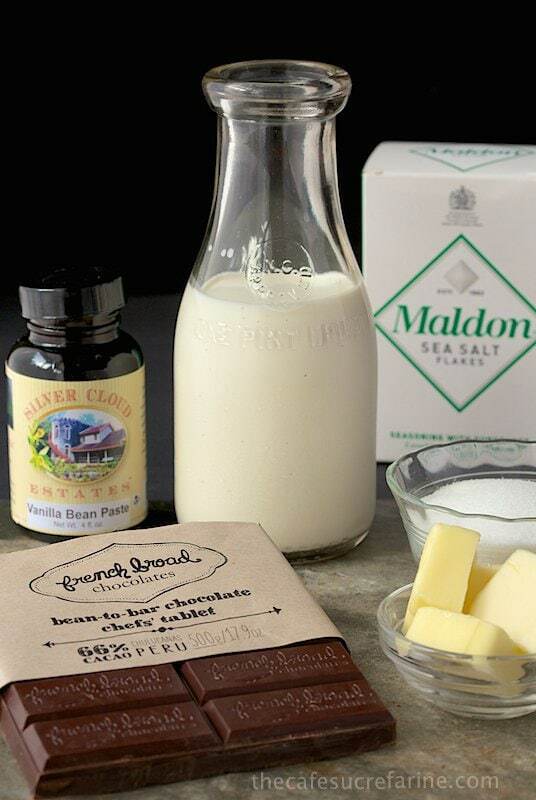 Pick up some good vanilla ice cream and whip up a batch of this Best Ever Hot Fudge Sauce. 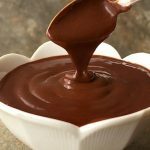 Everyone will think you’re a culinary whiz for making this heavenly, homemade chocolate sauce – just don’t tell them about the missing word that starts with an e.
P.S. French Broad Chocolate can be found in specialty shops all over the U.S. and can also be ordered directly from frenchbroadchocolates.com. Disclosure: We were given French Broad Chocolate at the conference, but have not been compensated for this post. The opinions are our own. 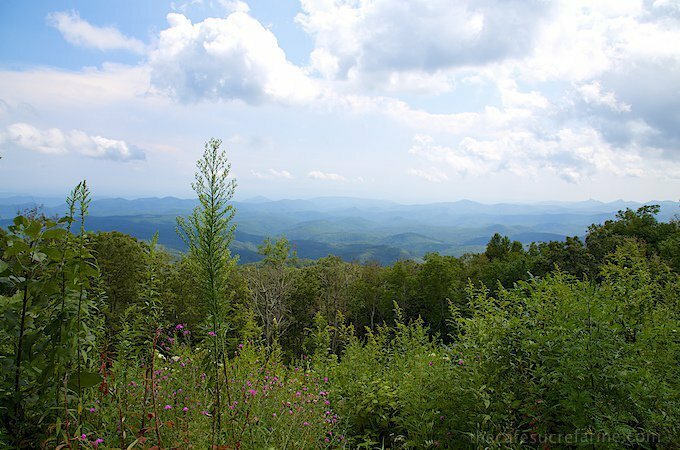 One of the multitude of gorgeous mountain panoramas surrounding the city of Asheville. If you’ve been to Asheville, NC, you already know how incredibly beautiful, charming and fun this area is. If you’ve never visited, put it on your “must-do” list, you won’t be disappointed! Be sure to try out some of the amazing restaurants (250 in all – see why they call it Foodtopia? ), wineries and craft breweries (18 of them!). Asheville also boasts 15 active farmer’s markets, lots of local farm tours, tons of amazing artists and the lure of magical mountain culture. 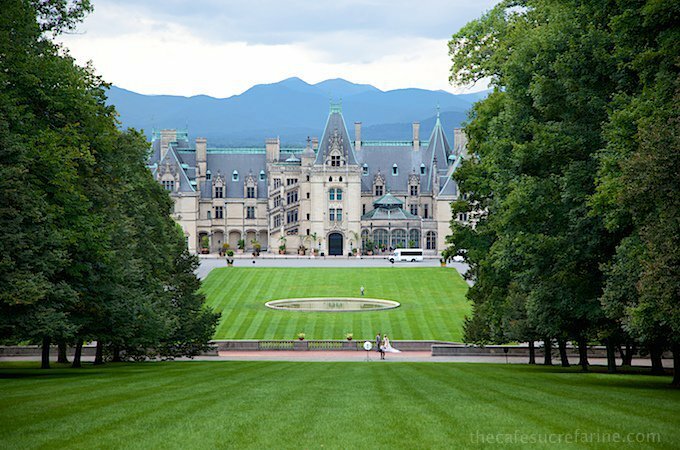 On top of all this, there’s the enchanting Biltmore House to explore and the Blueridge Parkway beckoning weary travelers with magnificent vistas around every curve. Just like the name says, this stuff is seriously the best ever hot fudge sauce. What the name doesn't say is now super easy it is, so easy you'll hardly believe it! Place all ingredients except half and half into a blender container. Measure half and half into a medium size microwave-safe bowl or measuring cup. Heat in the microwave on high power for 75-90 seconds or until it's vigorously boiling*. Make sure to use a big enough container to allow liquid to boil without rising over the top. Immediately pour over contents into blender and cover. Holding the lid to keep it securely in place, blend on medium-high speed for 1 minute. Remove cover and scrape down sides of blender container with a rubber spatula. Cover and blend again for another minute. Sauce should be smooth, silky and thick. Depending on the type of chocolate you use, the sauce may be too thick at this point. If you want to thin it a bit, add more half and half, 2-3 teaspoons at a time and blend briefly till combined. 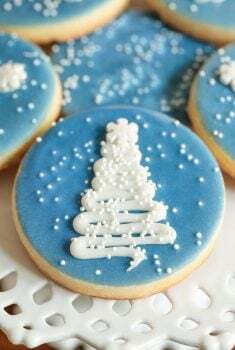 Continue until desired consistency is reached. Store in the refrigerator in an airtight container or glass jar. Keeps for 1-2 weeks. Sauce will get thicker when chilled, but will return to a looser consistency when warmed. Heat before serving on medium power in the microwave, stirring every 15 seconds until desired temperature. 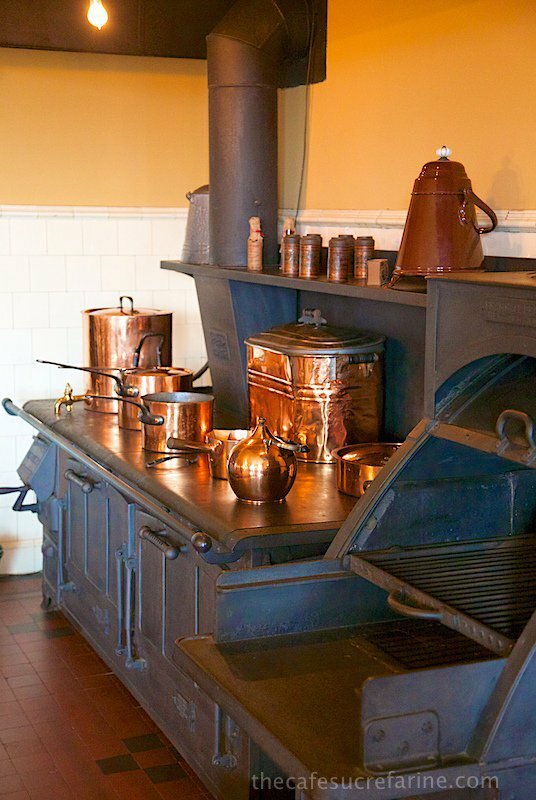 *Half and half can also be heated on the stovetop over medium heat until vigorously boiling. Stir frequently. Oh my gosh, just made this! Perfect texture and consistancy! What flavor! Very silky and smooth. Not grainy at all! Literally had it done in 5 minutes. Can’t wait to put this over some ice cream for national ice cream day! Perfection! Hi Maria, half and half is a combination of milk and heavy cream. If you live in the UK, it would be a 2:1 ratio of pouring cream and full-fat milk. 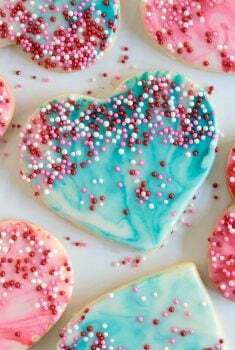 You could also make this with straight pouring cream. Thank God for Pinterest! The sauce is so delicious! Glad to have found your site too!! Thanks so much, Lauren. So happy you enjoyed it and welcome to The Café! Easy! Made it tonight using microwave for 1/2 n 1/2. I did use a quart jar & I wouldn’t recommend anything smaller. Maybe could have heated it once more after putting it all together but came out really good. Minute bits of chocolate not melted but enjoyable. WI used a scale for measurement of dark chocolate chips, only chocolate in the house, and that worked well. Will definitely make it again and share. Teenage grandchildren will have no problem making it. Thanks, Winnie, so glad you took the time to share a comment! I have made this several times using two Lindt Bars (total 7 oz). 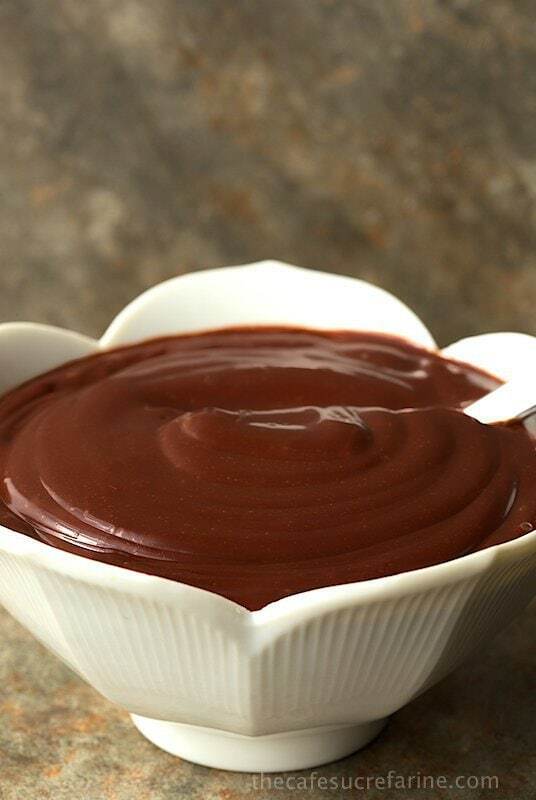 I usually use either 85% or 90% and it makes the most w nderful thick hot fudge sauce. I do usually have to thin it a bit and I do add about 1 Tbs extra sugar to account for the extra weight of chocolate. 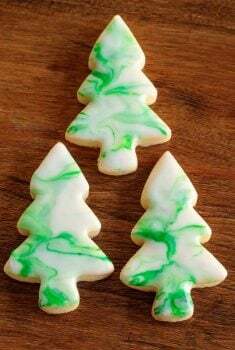 Thanks for an easy WONDERFUL recipe! Thanks so much for sharing your results with us Peggy! Hi Chris, just found your fabulous blog when I was looking for a really good choc fudge sauce. I am in the UK – Hampstead, London – and used single cream instead of half and half, which as you know we don’t have. I also used Lindt Chilli Chocolate. Apart from these I followed the recipe carefully, It was very e…. and tastes wonderful, however it is quite runny – it is chilling in the fridge as I write but is still runny. I blended for 2 and a half minutes and boiled the cream in the microwave for 90 secs. How can I thicken it up so it looks like yours? Hope you can help, many thanks, Beth. Wait till it’s completely chilled Beth (a couple of hours) that should help thicken it. 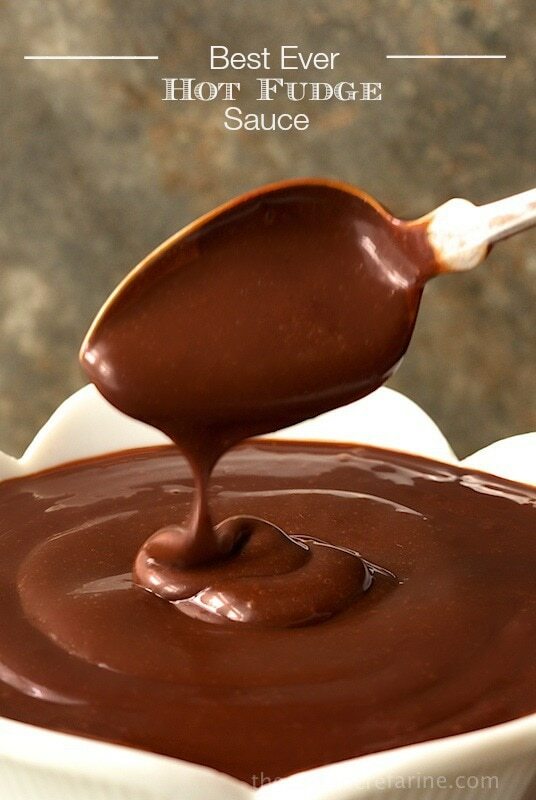 If it’s still thin, melt one to two ounces of chocolate, combine it with the sauce in the blender and chill it again. I just made up a batch and it really is great. 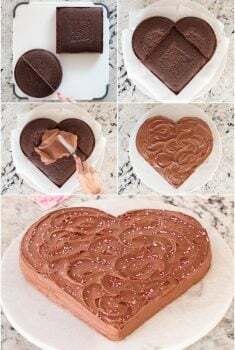 But I hate to clean up my blender, and hate to waste chocolate so here is an even easier and faster method. I nuked 1/2 c half&half in a pint canning jar (any heatable jar with a lid would work, I have a cute vintage one) until bubbly, almost 3 min. You could also set the jar in a pan of boiling water. Meanwhile I broke up a bar and a half of ghiradeli 60% dark and got out butter and extracts. I used some coffee extract that I had just bought in addition to vanilla. I added the chocolate, 2 tbsp butter, 1+ tsp extracts, and skipped the sugar. I stirred it vigorously and had to reheat a bit to get everything to melt together. Then I poured some over Hagen Dazs vanilla ice cream! Wow! The only cleanup is to lick the spoon! By itself the sauce is somewhat bitter and I can taste the extract alcohol, but on the ice cream it was plenty sweet. The sauce may be more runny but it thickened up when it got cold. I suspect it will get thicker upon reheating. I’ll add more comments if anything weird happens. You’re so welcome Judy! It’s a real keeper, isn’t it? Yum! Made this in 2 minutes! Extra star 6 for how easy it was! Thanks Wendy! Glad you enjoyed it!